(TORONTO, ON – January 24, 2014) Playtime never looked so good, with the bold styling, fun-to-drive performance, lots of storage space and an incredible list of features found in the 2014 Toyota RAV4. 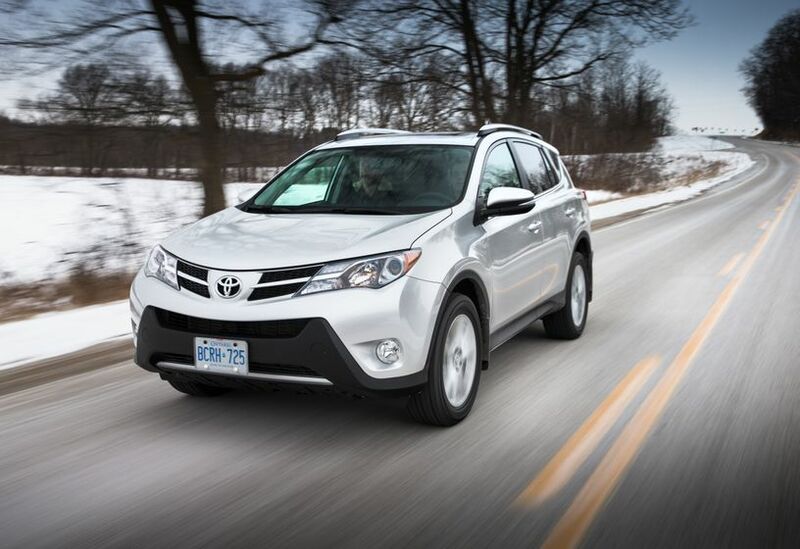 The 2014 RAV4 is offered in five models – two front-wheel-drive and three all-wheel-drive. Regardless of drive train, every model is engineered for fun, comfort, style, versatility and performance. All 2014 RAV4 models feature a 176 HP 2.5L 4-cylinder engine coupled to a six-speed automatic transmission with sequential shift mode and three driver selectable drive modes – Sport, ECO and normal – to match the RAV4’s performance and efficiency to one’s driving style or desire. The boldly sculpted body is more than visually distinct: The styling contributes to RAV4’ssignificant cargo capacity, plus an abundance of legroom for those sitting in the reclining rear seats. A lift-back rear door and lower loading height make it easier to load and unload up to 1,090 liters worth of groceries, golf bags, garden gear, or other goodies. The 2014 RAV4 also receives top marks for safety, as every model is equipped with eight airbags, anchor points for child protector seats, and more. As with every new Toyota since 2011, the 2014 RAV4 is also standard equipped with the six active safety technologies of the Star Safety System: Antilock Brake System, Brake Assist, Electronic Brake-force Distribution, Vehicle Stability Control, Active Traction Control and Smart Stop Technology work together to help drivers avoid potential accident situations. All 2014 RAV4 models come with comfort, convenience and style features, including: Audio systems equipped with USB inputs and Bluetooth connectivity for portable devices, plus steering wheel-mounted audio and Bluetooth controls; air conditioning with a dust, pollen and deodorizing filter; power door locks with keyless entry; a full range of instrumentation including a fuel economy meter, tachometer, dual trip odometer, eco drive indicator, outside temperature gauge and more; power windows with driver’s side auto down; front windshield acoustic glass; a three-spoke steering wheel on a tilting/telescoping column; cargo and map lamps; plenty of thoughtful in-cabin storage; cruise control; 12-volt accessory power outlet and retained accessory power; reclining rear seats with a 60/40 split fold down configuration, plus fold-down centre armrest; dual power adjustable and heated exterior mirrors with integrated signal lamps; a rear spoiler with integrated LED stop lamp; and more. These models have been enhanced for 2014 with colour-keyed exterior door handles as standard. Other features include: a four-speaker audio system with AM/FM/CD with mp3/WMA capability; adjustable driver and front passenger seats; fabric seat surfaces; 17” steel wheels; and more. These models may be ordered with the available Upgrade Package, which adds: an enhanced audio system with 6.1” Display Audio, six speakers, and voice recognition controls; heated front seats; rear privacy glass; roof rails; a tonneau cover; and a back-up camera. These models have been enhanced for 2014 with chrome inner door handles, automatic headlamps, and XM Satellite Radio. Other standard features include: a 6.1” Display Audio system with six speakers; steering wheel-mounted voice recognition controls; dual zone automatic climate control; heated front seats; premium fabric seat surfaces; a back-up camera; auto up/down function on driver’s side window; rear privacy glass; tonneau cover; scuff plates; a soft-touch instrument panel with stitching; 17” aluminum alloy wheels with locks; roof rails; a power moon roof; variable intermittent wipers; fog lamps; and more. These models may be ordered with the available Navigation Package, which adds: AVN Premium Navigation with Advanced Voice Recognition; SMS-to-Speech and Email-to-Speech services; Access to phonebook and streaming audio via Bluetooth; and more. This model has been enhanced for 2014 with the inclusion of XM Satellite Radio and AVN Premium Navigation as standard. The navigation system features: a 6.1” display screen, 6 speakers, Advanced Voice Recognition, including steering wheel-mounted voice recognition controls; SMS-to-Speech and Email-to-Speech services; Access to phonebook and streaming audio via Bluetooth; and more. Other standard features include: dual zone automatic climate control; eight-way power adjustable driver’s seat; heated front seats; SofTex trimmed seat surfaces; a back-up camera; auto up/down function on driver’s side window; auto-dimming rear view mirror; rear privacy glass; tonneau cover; cargo net; leather-wrapped steering wheel and shift knob; simulated leather door trim; chrome inner door handles; a sliding front centre console box; illuminated front cup holder; a power lift gate with remote operation; smart key system; push button start; scuff plates; a soft-touch instrument panel with stitching; 18” aluminum alloy wheels with locks; roof rails; a power moon roof; variable intermittent wipers; fog lamps; and more. This model may be ordered with the available Technology Package, which adds: an 11-speaker Premium JBL audio system; Lane Departure Alert System; Blind Spot Monitor; Rear Cross Traffic Alert System; Back-up Sensors; and Automatic High Beams.